Electron spectra for ionization of xenon by strong mid-infrared laser field calculated from the quantum-mechanical rescattering amplitude. Classical cutoffs of the electron drift energy for some characteristic orbits are represented by black lines. Above-threshold ionization (ATI), that is, ionization of an atom or molecule by an intense laser field, leads to an intricate electron spectrum that corresponds to a very large number of electron-photon interactions. Alternatively, the so-called simple-man model of ATI attempts, very successfully, a semiclassical description: Ionization into the lowest continuum state followed by classical motion of the electron in the laser field, at most one elastic scattering off the binding potential, and final propagation in the laser field towards the detector. In recent years, ATI by a mid-infrared laser field into electron states with very low energy has revealed various effects that are as eye-catching as they were unexpected. 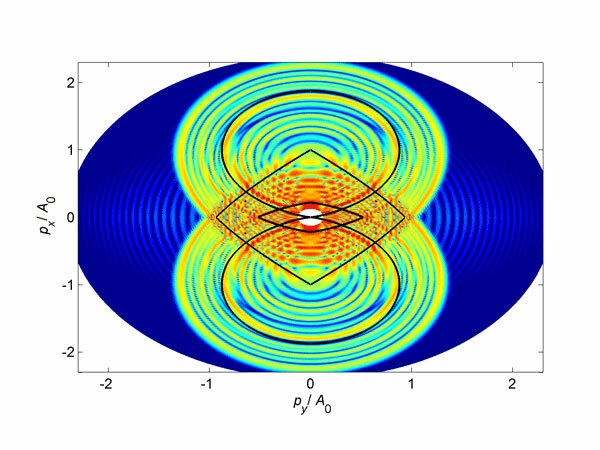 The model just described was not applied to low-energy ATI, because in this case the effect of the Coulomb potential was considered too dominant for the simple model to apply. Moreover, in the rescattering process, usually only backward scattering was considered, since this allows the electron reach to high energies not attainable otherwise. Forward scattering was ignored, because the electron does not require rescattering to end up in a low-energy state. However, forward scattering off the Coulomb potential is very strong so that it may become the dominant process. W. Becker and D. B. Milošević, from the Max-Born-Institute, Germany, and the Faculty of Science, University of Sarajevo, Bosnia and Herzegovina, demonstrate that the various recently observed low-energy ATI effects for mid-infrared laser fields can be traced to forward and backward rescattering processes. It is reported in Chinese Optics Letters Vol.13, No.7, 2015. The simple picture was extended to electrons emitted into arbitrary direction with respect to the laser field yielding an intriguing velocity map. The corresponding quantum-mechanical so-called strong-field approximation has the classical model embedded and produces velocity maps that can be compared with experimental data. In the words of the authors, Wilhelm Becker and Dejan B. Milošević, "It is truly amazing that the simple classical model allowing for at most one act of rescattering describes the rich low-energy electron kinematics as well as it does." The features of low-energy ATI described in this work are universal, that is independent on the specific atom or molecule. Comparing measured velocity maps with this theory may help to identify atom- and molecule-specific materializations of the laser-matter interaction.